NEW YORK — The firm picked by the city to run what is meant to be the nation’s largest bicycle share program has been dogged by questions about how it got a contract to run a similar system in Chicago, while its partner is being sued by a key software developer. “There’s still work to be done — features to be added — and that’s where we are at the current time,” said Philip Pugliese, of Bike Chattanooga. 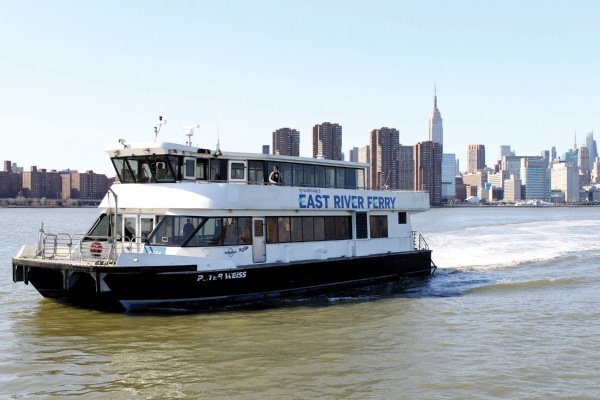 Today’s ferry system is balkanized, with about half a dozen private operators carrying passengers across the Hudson and East rivers, as well as other parts of the metro area. The Staten Island Ferry, which accounts for the largest share of waterway ridership, is run by the Department of Transportation. Stroll down East 7th Street in Manhattan’s East Village, go past St. Stanislaus Catholic church, just beyond the Butter Lane cupcake shop, you’ll find Big Gay Ice Cream. And the tiny shop is often packed.Customers squeeze in against unicorn-covered walls, or wait patiently in line outside. They’re all waiting for funky frozen treats like a Bea Arthur, Salty Pimp or a Mexican Affo’gay’to. Some pose for pictures in front of the storefront window featuring a rainbow-swirly ice cream cone.The novel-yet-wildly successful ice cream venture has gotten tons of press from publications as diverse as Men’s Healthmagazine and the Huffington Post, the Food Network and The Rachel Ray Show. 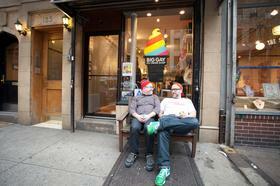 Big Gay Ice Cream was the brainchild of co-foundersDouglas Quint and Bryan Petroff who began it as a seasonal food truck in 2009. They opened their first brick-and-mortar location in 2011 and followed it up last year with a second storefront location in the West Village. Today, they’re introducing a soft-serve variety to their ice cream repertoire. NEW YORK CITY-As showcased at SL Green Realty Corp.’s Earth Day celebration Wednesday, the inset of a 17th floor roof at the REIT’s 100 Park Ave. is covered with green vegetation that looks out of place among Midtown skyscraper peaks. The “green roof” installation, one of 14 at the newly retrofitted property, catches rain water, eliminating runoff and–unlike its heat radiating concrete neighbor roofs–naturally absorbs rays from the sun, helping cool the building’s interior. Retrofits like these may become a requirement citywide if the Bloomberg administration has its way. Contained in the proposals announced by Mayor Michael Bloomberg on Wednesday are mandates that require older buildings to invest in necessary technology and infrastructure that would increase energy efficiency and reduce the city’s carbon footprint. New York City’s buildings are responsible for 80% of its carbon emissions. The investments could prove costly, but promise tremendous savings in power bills for thousands of properties. NEW YORK CITY-The sidewalks surrounding the 16 acres in Downtown Manhattan known as Ground Zero are still covered by tourists, who are forced to hold cameras high above their heads in an attempt to peek over the blue-shrouded fence guarding the construction site. Eight years after the event that drew those tourists there in the first place, construction at the site has been slow to come, marred by inefficiency and public frustration, and for the last year or so, a very public dispute between politicians, a massive public agency and commercial real estate interests. Others agree that that the volleying between the involved parties has grown confusing. “The political ping-pong game is very disconcerting to tenants and the brokerage community at large, because people are seeking clarity and specific direction in this marketplace,” says Robert D. Goodman, senior managing director at FirstService Williams. Goodman, who worked at the World Trade Center, says he’d just left his office one minute before the events of 9/11 unfolded. He says that personal history, plus a career centering on the Downtown market, has contributed to his keen interest in what happens at the site. evolved into a scaled-down version of what was originally sold to public officials and city residents. the project has not been released. The spokesman said. (CNN) Can You OD on Caffeine? Can you OD on caffeine? © 2013 Cable News Network. Turner Broadcasting System, Inc. The FDA says it’s taking a fresh look at caffeinated food and plans to hone in on how energy drinks impact young people. Editor’s note: upwave is Turner Broadcasting’s new lifestyle brand designed to entertain the health into you! Visit upwave.com for more information and follow upwave on Twitter, Facebook, YouTube,Pinterest and Instagram @upwave. As he was driving down an Ohio freeway minutes after swallowing five Magnum 357 caffeine pills, Christian Brenner started to vibrate — and the cars in his rearview mirror did as well. Fortunately, Brenner pulled over and walked around in an effort to try and come down. Today, he swears off caffeine, even coffee — the mental aftereffect of what he says was straight-up caffeine poisoning. upwave: Is coffee bad for you? 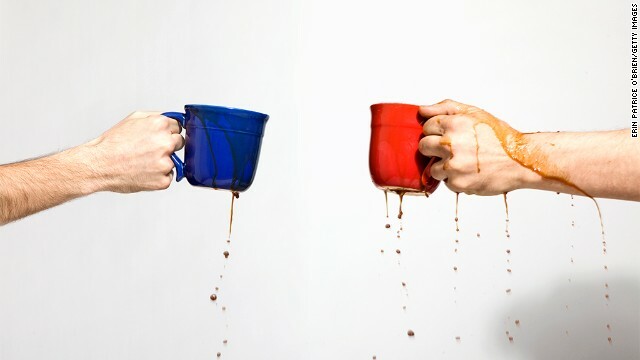 Caffeine acts as a stimulant in humans. It can be found in the seeds, leaves and fruit of plants like coffee or kola nuts. “Safe doses of caffeine are usually quoted at around 200 to 300 milligrams, or two to four cups of coffee per day,” says Dr. David Seres, associate professor of clinical medicine at Columbia University. The kiosks at the Graybar Passage in New York’s Grand Central station have one strong advantage: high traffic. These high-end retailers offer a slice of New York to locals and tourists alike. Jones Lang LaSalle assistant manager Laura Blaustein oversees retail operations at Grand Central Station’s Graybar Passage. She took Specialty Retail Report on a tour of retail kiosks in the busy commuter saturated corridor. Located on the northeastern section of the 100-year-old train station, the path tunnels from the main terminal over to Lexington Ave. Blaustein calls this section of the terminal’s retail stock an incubator for local small, independent businesses. Merchants rotate at the kiosks, usually for three or four-month intervals. Blaustein said the Grand Central retail realtors can use their expertise to help nurture the merchants for the time they are here. “A lot of these merchants would like to stay here for longer periods, but, we like to mix it up for the commuting customers,” she said. The kiosks have been operating in the corridor for seven years now. Each of the merchants offers a sampling of distinctly New York crafts, colors and flavors. For the past couple years, dealers have been standing on the sidelines watching lenders and regulators go to head to head on fair lending issues. Since late last year, though, dealers ― who are officially exempt fromConsumer Financial Protection Bureau oversight ― have slowly been drawn into the match, and now they’re now gearing up for the latest bout. At the recent National Automobile Dealers Association convention in New Orleans, conversations about compliance overheard in elevators, along sidewalks, and even at a French Quarter oyster bar overshadowed stories of vibrant dealer performance, as players in the market discussed how to be best prepared when the CFPB (www.consumerfinance.gov) comes knocking. In a lively speech, NADA’s incoming Chairman Forest McConnell III told members that the Washington, D.C.-based organization is working through the tough regulatory and legislative changes. In an effort to appease government concerns, NADA (www.nada.org) unveiled details of its new Fair Credit Compliance Policy and Program. The move comes on the heels of a Fitch Ratings (www.fitchratings.com) report last month that says compliance requirements will likely raise regulatory costs for lenders in 2014 and could lead to the elimination of dealer markups altogether. NADA’s new compliance program template seeks to avoid such a move. Increasingly relaxed credit underwriting standards in the subprime auto world are helping lift auto sales across the country, according to a report today from Bloomberg News. Bloomberg checks in on Houston auto dealer Alan Helfman, who tells the story of a customer who drove away with a new Dodge Dart-despite a credit score south of 500. 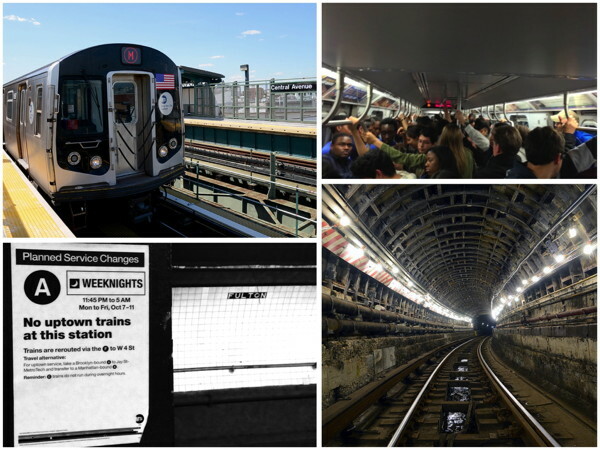 NEW YORK — Subway trains arrive at stations late at night too crowded to board. A train that usually travels express often runs local after a certain hour, and some routes have been remapped entirely thanks to Superstorm Sandy repairs or other long-term upkeep. Scores of the city’s bridges and highway overpasses are considered structurally deficient and fixes have been progressing at a snail’s pace. When construction happens, cars sit on highways for upwards of an hour, waiting to get from point A to B. Figuring out where new transit money might come from is perhaps one of the biggest challenges facing policymakers — and the next mayor — in the years ahead. Transit advocates say there are workable solutions, from levying “impact fees” on new development to a “toll swap” proposed by “Gridlock” Sam Schwartz. I remember the first time I went to Los Angeles. It was sometime in the early 1990s. As we descended into LAX on the flight from New York that morning, my friend told me to look out the window. I couldn’t see much because it was so cloudy. He told me that was normal: that by midday, all that haze would burn off. We stayed with a woman who’d moved out there from here in the city. She lived in a bungalow-style house on a street in Hollywood I can’t remember the name of. Over the course of three days, we did a few fun drives. We took a ride up to Malibu, and at some point one evening we had sushi. One memory from that truly stands out. The sense of wonder I felt the first time I walked into her backyard and saw a lemon tree, with big round yellow pieces of fruit dangling from its limbs. Over the years, I’ve watched Chinatown and Melrose Place. I’ve listened to Tom Petty and The Mamas and the Papas and then, there’s Hole. What Stories Do Those Subway Benches Hold? There’s a special place in Hell that’s the spitting image of New York City subway platforms on hot and humid summer nights. After hours, when MTA’s capital construction efforts translate into fewer trains, the wet air, acrid stench are relieved only by napkins or towels, used to wipe sweat. In New York City, anything can happen and the misery of heat has been known to contribute to all manner of misbehavior-or not. On the last Sunday in February at around 8 p.m., Jon Jensen, who teaches English at Kingborough College in Brooklyn, was walking north on Frederick Douglas Boulevard near 135th Street in Harlem. In one hand, he held a leash, to which was attached his fluffy white Pomeranian dog, Bumpy. In the other hand, he had out his iPhone 5. As he was checking a text, a woman bumped into him, and he dropped the phone onto the sidewalk. The woman made a grab for the phone, took it and then began to calmly walk away up the avenue. Jensen described the woman as mid-30s, wearing jeans, a gray jacket and tennis shoes. Jensen said he was dressed similarly, wearing jeans, a green jacket and tennis shoes. Late one warm August afternoon, the food, drink and people carnival that is the stretch of Ninth Avenue running down the center of Manhattan’s Hell’s Kitchen is up and running. Clinking plates and glasses join random chatter up and down the main drag. One storefront space sits quiet, or so it appears. Behind a brown fabric curtain in the window, drills drill, hammers hit nails and four old friends, now business partners, put finishing touches on a new gay bar they’re saying is more downtown than up. 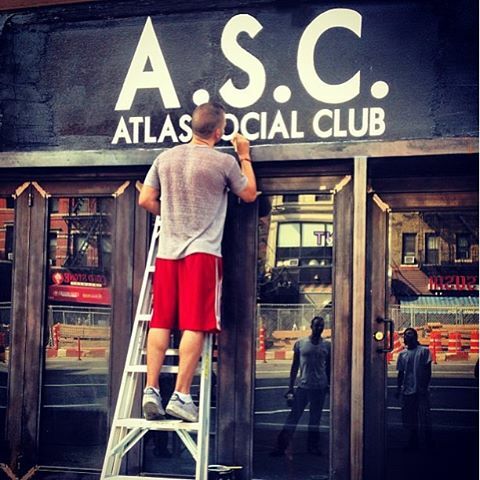 Atlas Social Club is set to open in mid-September. It’s gotten plenty of headlines due in part to co-owner Benjamin Maisani’s relationship with the CNN anchor Anderson Cooper. There’s also another unique New York story, rooted in a four way friendship, inspired by a city’s innate ability to drive and fulfill entrepreneurial spirits. Some might say New York is the only city in the world where four friends, all from different points on earth, (Maisani is from France, Pablo Raimondi, Argentina, Asi Mazar, Israel and Josh Wood is from Illinois) might randomly meet, become close friends, and well over a decade later, form an ambitious business partnership based in a tough as nails business — nightlife. Does it really take a village to raise a healthy child, instead of one or two loving caregivers? If so, why? And, more importantly, what are parents supposed to do with that information? Or does distance drive a wedge between us and our loved ones? Experts say the truth lies somewhere in the middle. Am I more Productive When I Multitask? Family Dinner: How Do I Get My Kids To Enjoy The Ritual? Child-development experts say that although TV, playtime and tight work or after-school schedules sometimes get in the way, sticking to a regular sit-down dinner routine holds more value for families than just nutrition. The time that a family spends together at the table has been shown to reduce all sorts of problems for kids in school — and even later in life. But how to get the kids to actually sit down at the table for an hour — let alone enjoy it? thrive:Does Vegging Out On TV Recharge Me? It’s been a busy week, and now you’re curled up on the couch alone — just you and your big bowl of reduced-fat kettle corn — watching your seventh episode of The Golden Girls in a row. Four hours later, do you say to yourself, “I feel great!”, or “I wish I’d gone out with my friends instead”? Did the magic of television recharge your batteries, or did it enervate you? The answer might depend on your personality type. Rattle Inn, one of the newest bar and music venues in Austin, is open and the owners are planning a big kickoff Jan. 23 headlined by venture co-partner Ray Benson’s band Asleep at the Wheel.The 7,500-square-foot space at 610 Nueces St. will be three bars in one. Rattle Inn is the love child of Benson, Ranch 616 owner Kevin Williamson and Matt Luckie, who owns Lavaca Street Bar & Grill and Gibson. Williamson and Luckie also co-own Star Bar.Benson, Luckie and Williamson said they’ve invested more than $500,000 in the new space but wouldn’t disclose details. 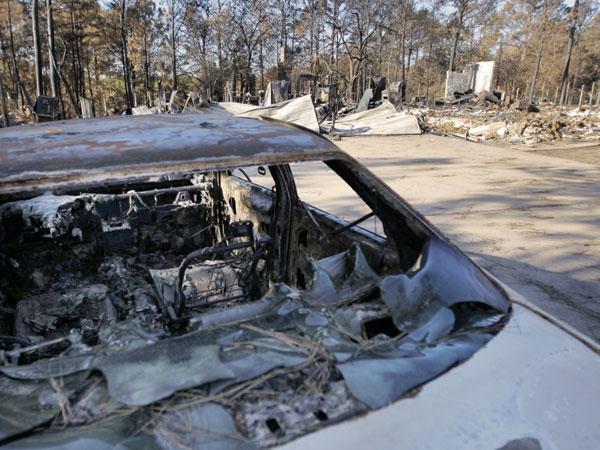 Bastrop County land values could be cut in half as the real estate market faces dramatic ups and downs resulting from the wildfires that scorched almost 35,000 acres. Dramatic value dips would be problematic for many landowners, but they could yield opportunities for investors looking to employ a patient buy-hold strategy while this patch of Texas recovers. “We’re confident there will be some devaluation in the acreage charred by the fires,” said Cameron Boone, director of research at Lewis Realty Advisors Inc. Lewis Realty estimates the value of land directly impacted by wildfires could drop by up to 60 percent. This might open the door for what some call vulture investors, who swoop in and offer pennies on the dollar for damaged properties, Boone said. NEW YORK — New Yorkers love to complain about their subway system: It’s too slow, too expensive, too dirty. And, worst of all, it’s too difficult to understand why. A group that works to keep the MTA accountable is set to release findings on Tuesday from a long-term study titled “The MTA in the Age of Big Data,” which looks at the state of the agency’s efforts to make data accessible to the public. NEW YORK — It was once known as the venerable train to the 1939 New York World’s Fair and was a critical transit artery for workers at industrial plants churning out materials for World War II. “It’s a wild card as far as when I’ll get to work or back home,” said freelance theater director and Greenpoint resident Josh Hecht, who takes the G train daily and says he leaves home an extra twenty minutes or so early to get to work appointments. The Metropolitan Transportation Agency, in response to calls from state lawmakers and a new transit advocacy organization for improvements like increased frequency of trains and communication with riders on the line, has announced that it will do a so-called “full line review” of the line by June. That review could result in major upgrades to one of the city’s most neglected lines. NEW YORK — The latest delay of the city’s bike share program is being blamed on damage caused to equipment by the floodwaters of Superstorm Sandy. 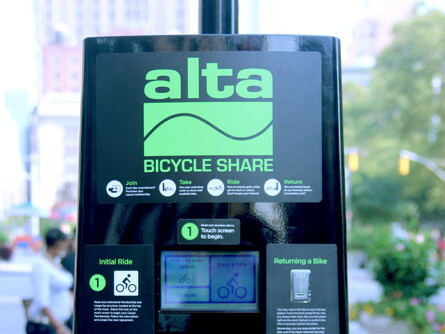 The bike share will now launch in May 2013, with 5,500 bikes instead of 10,000 as initially planned, the city’s Department of Transportation said in a news release Friday. The bikes will now roll out first “in the densest and most geographically contiguous parts of the service area” of Manhattan and Brooklyn.